For millennia, people throughout the world have told stories-to entertain, to inform...and also to try to make sense of the universe around, to inform.and also to try to make sense of the universe around them. 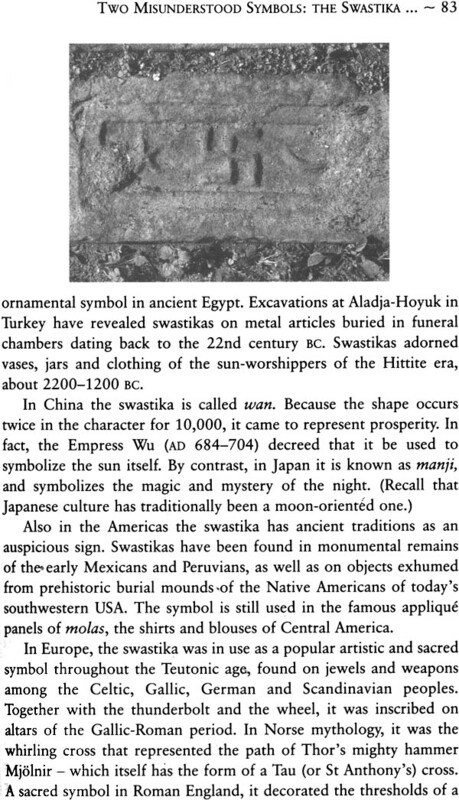 Every religion has developed its own set of “stories’-myths, legends, parables- accompanied by a system of rituals, symbols and various traditions. Just as religious systems evolve and develop, so do their stories and traditions. The Buddhist stories told in Thailand, or in Korea, or among Zen Buddhists, often differ from those told in India, or in Nepal, or Tibet. 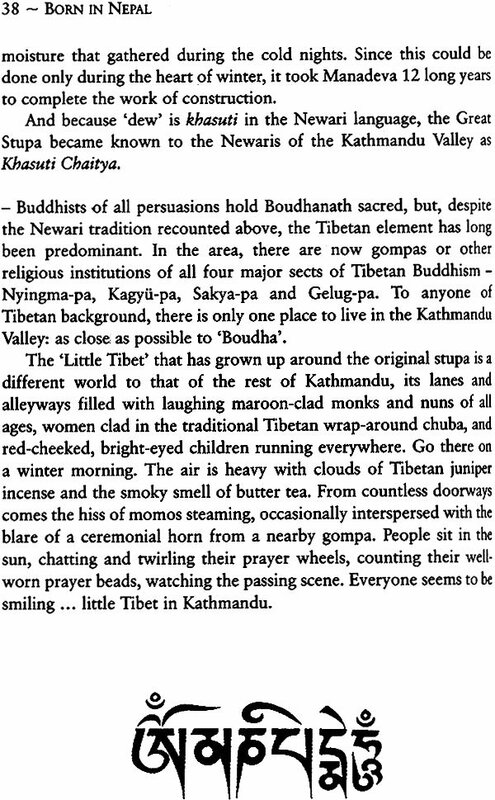 Also within the same country there will be variations, as exemplified by the many syncretic Hindu-Buddhist Newari legends of the Kathmandu Valley as compared with the Tibetan Buddhist tales of the Himalayas. This miscellany focuses on one aspect of the vast array of stories, legends, rituals, traditions and symbols that have developed within the world religion known as Buddhism: namely, those dealing with Nepal. 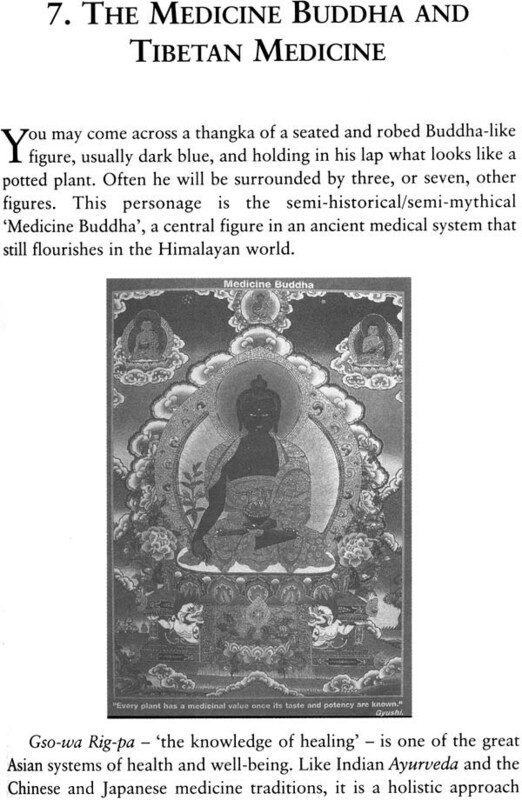 After all, it was in Lumbini, in southern Nepal, that the historical Lord Buddha was born over 2,500 years ago. This volume is meant as a general introduction for all those visitors to Nepal who wish to learn more about its rich and living Buddhist heritage. The author, Susan Hoivik, has lived, studied and worked in Nepal for many years. She holds degrees from the University of Oslo, Columbia University and Leeds University, and is currently, and is currently working for Eco Himal-Society for Ecological Co-operation Alps-Himalaya, under whose auspices this book is published. Just as religious systems evolve and develop, so do their stories and their traditions. Time and place are important-today’s Hinduism is not identical to that of Vedic times, nor is, for example, the Christianity of the Early Church Fathers the same as that practised in India’s Goa or among US Southern Baptists today. 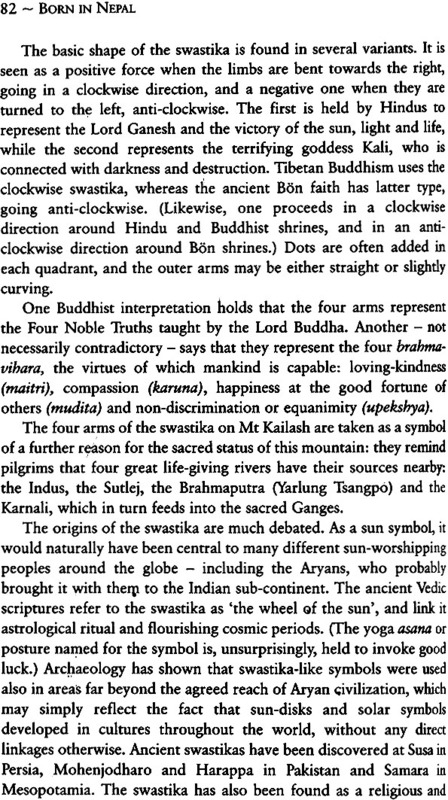 Likewise, the Buddhist stories told in Thailand, or in Korea, or among Zen Buddhists, often differ from those told in India, or in Nepal, or Tibet. Also within the same country there will be variations. Some may be a matter of purely local touches, like inserting a nearby place name in a popular legend. Others reflect differing branches within the same faith, as is the case with the many syncretic Hindu-Buddhist Newari legends of the Kathmandu Valley as compared with the Tibetan Buddhist tales of the High Himalayas. 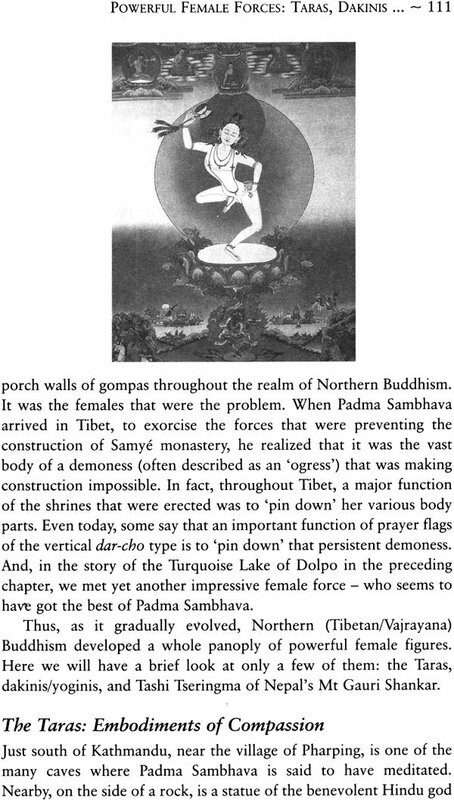 There exist many good general introductions to the complex subject of Buddhism. In this miscellany I have chosen to focus on one aspect of the vast array of materials-stories, legends, rituals, traditions and symbols-that have developed within the world religion that started some 2,500 years ago: namely, those dealing with Nepal. Not only because it is here that I have had the good fortune to live, study and work for nearly a decade and a half. No, I have also a point to make: Despite the many books and articles and websites that give the impression that Buddhism is of purely Indian origin, the historical Lord Buddha-Siddhartha Gautama, a prince of the Sakya clan- was born at Lumbini in southern Nepal. The site has been recognized by UNESCO and inscribed on its World Heritage Cultural Sites list. Now, this ‘nationalities’ issue is a complex one, not least because in earlier days there were no such entities as ‘Nepal’ or ‘India’ only scattered small kingdoms and princely fiefdoms that squabbled and fought, some conquering and absorbing others, some vanishing from the annals of history. No matter where he was born, the Buddha cannot be said to be ‘Indian’ any more than, say, Peter the Great could have been said to be a ‘Soviet’ man. The concept simply did not exist, ‘India’ as a term originally referred to the lands around the Indus River; its application to the vast triangle stretching from the Punjab to the Bay of Bengal and southward to the ‘Indian’ Ocean gained currency only with the rise of the Dutch and British East India Companies from the 1700s. And to the north, the small kingdoms and fiefdoms of the territory that comprises today’s Nepal became unified as a modern state in the late 1700s with the conquests of king Prithivi Narayan Shah that culminated in his subduing the city-states of the Kathmandu Valley between 1765 and 1769. 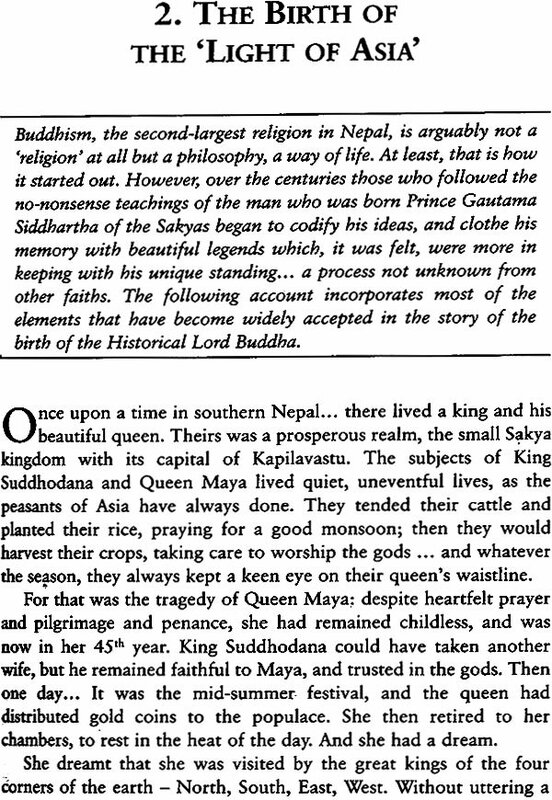 Later, when the modern international borders were drawn up, Lumbini and what archaeologists say must have been the palace of king Suddhodana definitely ended up on the Nepali side-thus the title of this book. Religions are not static, neither are their legends- or whatever one chooses to call them. The term ‘myths’ tends, unfortunately, to be widely understood as applying to traditions that are far off, less modern, and usually safely dead. 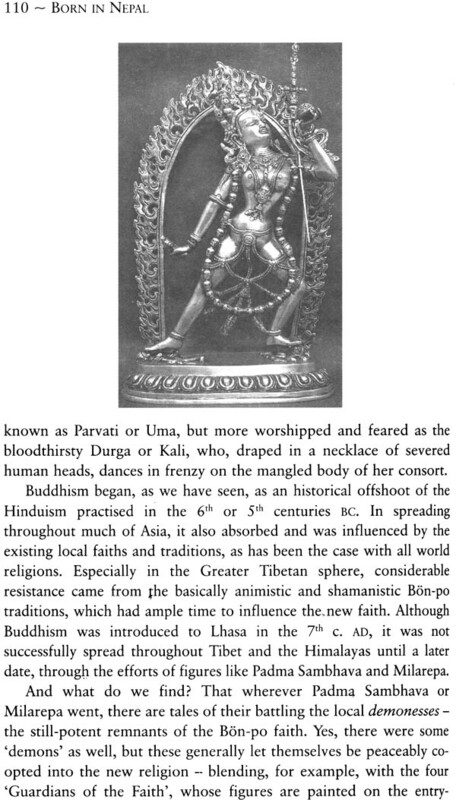 That millions of devout believers today swear by what many Western anthologies label ‘Hindu mythology’ and describe in the past tense simply shows that cultural imperialism still flourishes. As anthropologists know, relativity is a central concept in dealing with cultures and their beliefs. One man’s ‘myth’ may be another’s basic tenet of belief. Nor is Western ‘rationality’ the sole valid yardstick: every religious system, every mythological system, has its own inner logic. And that must be accepted, if we are to understand anything at all. I happen to be in the process of relocating to a tiny village (population: 36) in the mountains of southern Cyprus. Although from a totally dispassionate angle it might seem a logical or rational description, I know better than, in talking with my new neighbours, to speak of the Virgin Mary as ‘a Jewish teenager who got pregnant but was lucky enough to find herself a tolerant older husband’. Those who protest at the ‘irrational’ nature of much of what is presented in this book would do well to examine the tenets and traditions of their own faith. This volume is not intended as a scholarly work, far less the definitive compendium on the subject. Much detail has had to be omitted, and the spelling of Sanskrit, Nepali and Tibetan words has been simplified. I simply hope that visitors to Nepal may find the book both interesting and informative. 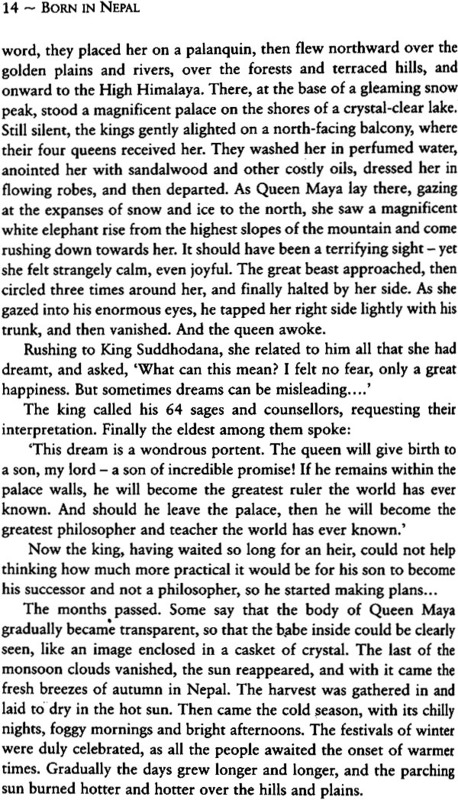 To that end I have also added some background remarks to many of the stories retold here, while attempting to keep the footnotes to an absolute minimum. Much of what is presented draws on oral tradition, but the reader will find some references and suggestions for further exploration at the end.